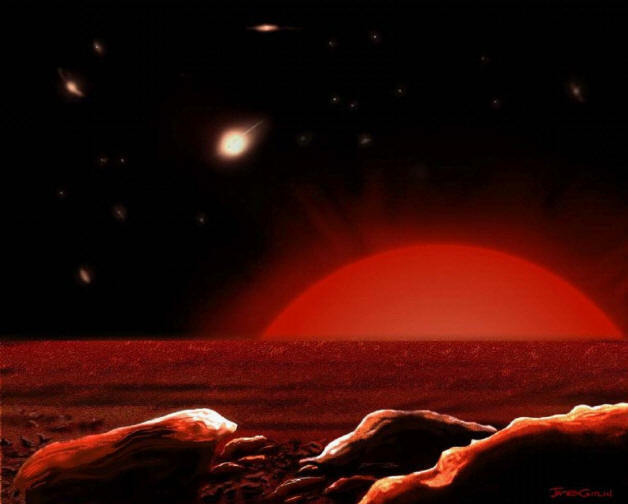 A red giant star rises over an imaginary horizon. Artist: James Gitlin. Of course, what consensus astronomers think is possible excludes the possibilities from dissenters and other sciences. The consensus model attributes the luminosity variations to mechanical pulsations: the star expands and contracts, growing brighter and dimmer, its light output bouncing like a lid on a boiling pot. The boiling pot is the assumption that defines the consensus: a star is a gravitationally bound and internally heated ball of gas. Complicating the consensus model is a longer-period secondary variability in some of the stars. As well, the stars eject an abundance of matter or surround themselves with expanding rings. It’s hard to stretch the Victorian-era theories of gravity and gas around those observations, and the sharp details of the new observations have poked holes in the theories’ coherence. 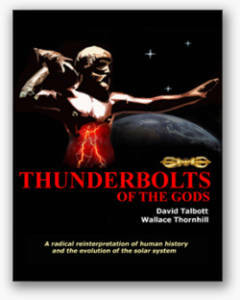 The Electric Universe is one of the dissenters: a star is an electromagnetically bound and externally powered discharge in plasma. A red giant is a star without a photosphere. Instead of the high-current-density arcs, or anode tufts, that radiate heat and light at high temperatures from the “surfaces” of stars like the Sun, a low-temperature chromosphere has expanded to scavenge enough electrons to maintain the red giant’s discharge. Without a photosphere, the star lacks the regulatory mechanism that maintains a constant output in sun-like stars. 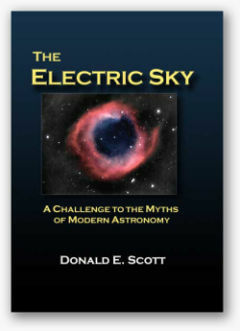 (See “Transistor Action at the Solar Surface” in The Electric Sky by Donald Scott, p. 96.) Variations in the supply current cause the chromosphere to expand and contract, balancing the electron flow. The current density—and so the luminosity—vary in step. The same effect occurs on the Sun above the (regulated) photosphere. The corona is exposed to the unmoderated supply current, and its luminosity varies accordingly. Since the Sun is much smaller than a red giant, the current density at the corona is much larger and the radiation is in the ultraviolet and x-ray range. In those wavelengths, the corona is dim at solar minimum and bright at solar maximum. The chromosphere of a red giant is cool, so it is loaded with molecules and dust (clumps of molecules). It acts as an anode in the discharge, and the molecules and dust are positively charged. They act as charge carriers in the same way that protons do in the hotter discharge current (called, in consensus theory, a “wind”) of the Sun. Astronomers see this flow of material and call it mass ejection, ignoring its electrical nature. The acceleration of the charge carriers away from the anode—a characteristic that contradicts the idea of mechanical mass ejection—is due to the electric field. Naturally, as the driving voltage varies, the current—and hence the loss of matter—varies. The rings seen around some red giants appear when the dusty and molecular plasma of the positive current collects in the toroidal or ring currents that form around the discharge axes. A persistent current requires a circuit, otherwise the positive charges build up at one end and the negative at the other until the electric field between them cancels out the driving voltage and the current stops. The presence of other elements in the circuit along with the red giant’s chromosphere can produce oscillations in the current. Those other elements are such things as double layers, which may be invisible and which have capacitive properties, and the galactic Birkeland currents that act as transmission cables, which have inductive properties. Thus the periodic variations in the red giants’ luminosity are neither unexpected nor difficult to explain: Our radio and television technologies are based on the fundamental ability of capacitors and inductors to cause oscillations in current flows. These circuits can be traced in the spiral arms and magnetic fields of galaxies and between galaxies. 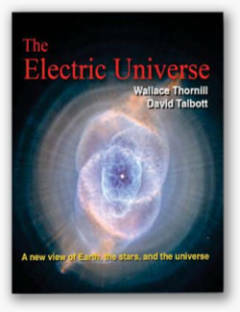 The Electric Universe insight that a star is a plasma discharge in an external circuit provides a vision of the cosmos that is the diametrical opposite of the consensus vision. In the latter, the cosmos is a scattering of isolated specks in a vast emptiness; in the former, it is an interconnected web of coupled circuits.